Perhaps for your next grand dinner, you want to draw on the old English style. You want something rustic and homey. You also want something that does not lack for elegance, while also merging elements of nature in. 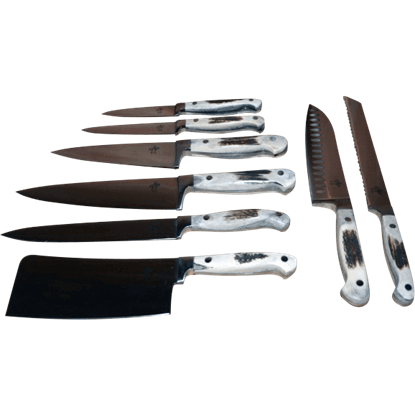 What you want is a table setting made up of elements from the Lodge Style Fine Dining Collection. Inspired by the look and feel of an old English hunting lodge, this collection is all about elegance and nature, as well as a comfortable sort of appeal that hunting lodges were famous for. 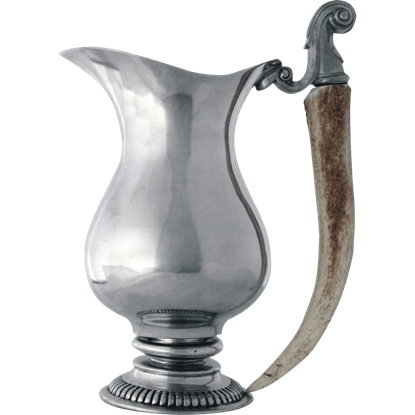 Antler and pewter are common materials for this section, used to craft the handles of cutlery, the grips of tankards, and the columns of candle holders. 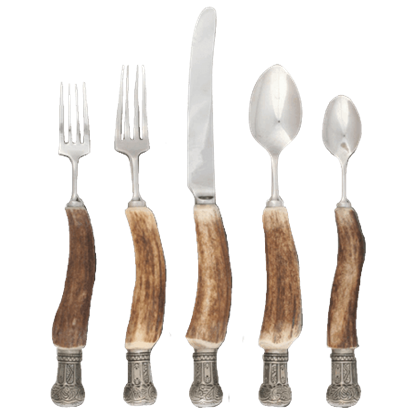 Alongside the antler comes various accents modeled after elk and deer, shaped into the stems of fine wine glasses, candle sticks, bottle stoppers, and more. 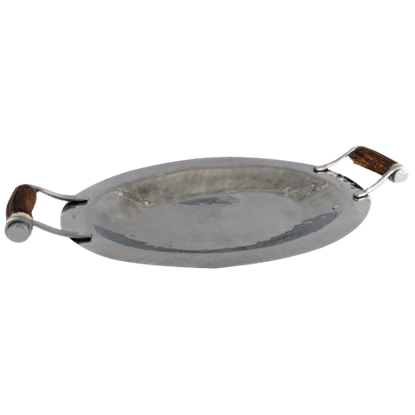 Where food is concerned, this collection also features deer head salt and pepper shakers and elegant trays, including a wood cheese tray with pewter antler handles and a pewter serving tray with reclaimed antler grips. For a nice drink with your meal, you can also enjoy antler and elk capped decanters! Elk, deer, and antler detailing in these pieces makes it seem like each one is a unique piece, perfectly suited to the look and feel of a traditional hunting lodge. Transform your table and your dining room by grabbing a few elements from the Lodge Style Collection and then welcome your guests into an old fashioned lodge setting at your next dinner party. 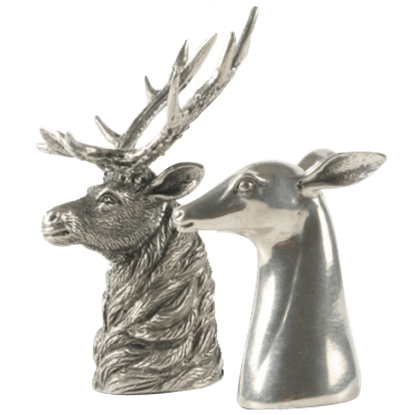 Magnificent and stunning, this elk candleholder displays a highly detailed statue of an elk head handcrafted from luxury pewter. 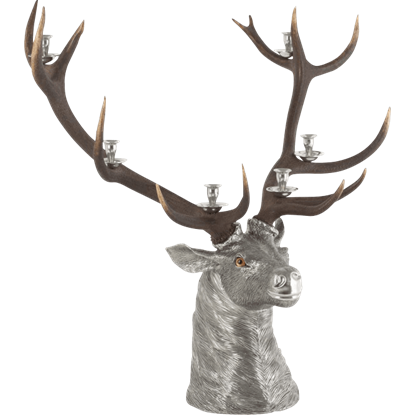 The 6 Taper Elk Head Candelabrum features an actual full rack of real shed antlers. Two half rack antlers extend from an exquisitely detailed wreath of acorns, pinecones, and oak leaves around the base of the pillar candleholder. 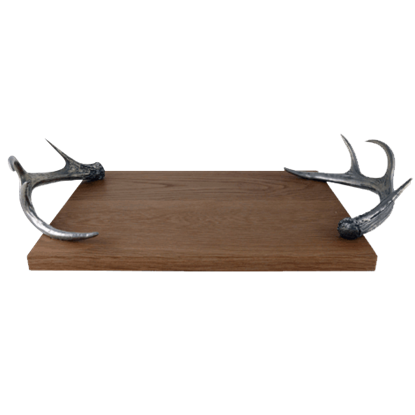 The Antler Rack Hurricane Candleholder makes an elegant centerpiece in any home. Large enough for everyday use and unique enough to give as a gift, the Antler Salt and Pepper Set offers a stunning way to serve these classic condiments. 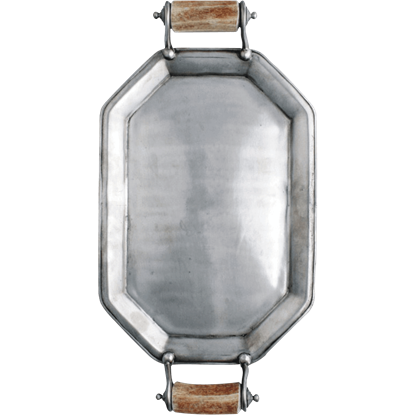 The rustic shakers are crafted from pure pewter for a gleaming look. 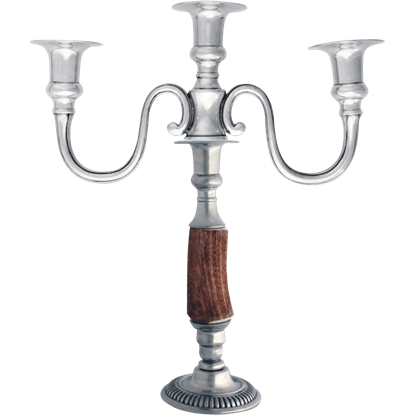 The Antler Stem Candelabrum adds a regal touch to any room of your home or special occasion with its classic design. 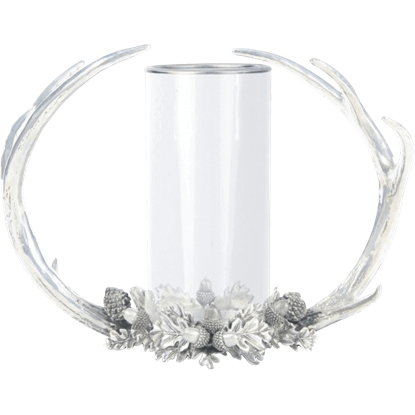 This elegant antler candleholder is crafted from fine luxury pewter and accented with hand-turned antler. 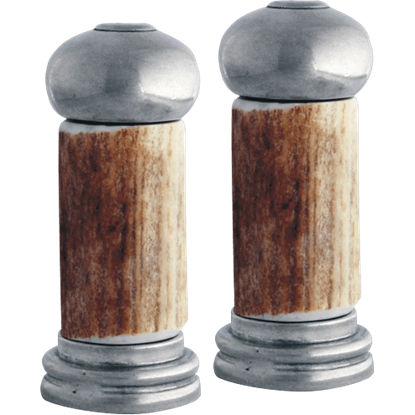 The Stag and Doe Salt and Pepper Shaker Set is sure to be a conversation starter when used on a traditional, seasonal, or holiday table. These lodge style shakers offer a hint of rustic design to the look of your table setting. The versatility of this shed antler candlestick is almost unlimited. 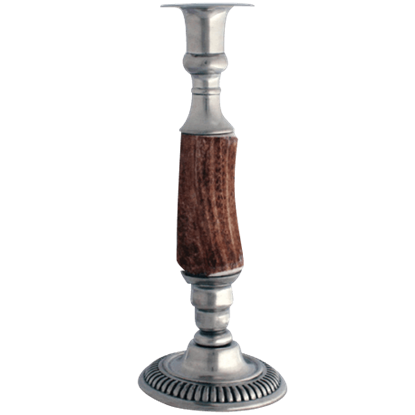 The Candlestick Holder with Antler Stem can be placed anywhere in your home to set the proper mood for your formal dinner or other elegant social gathering.